No-one knows how many common dolphins die each year in fishing gear in the Northeast Atlantic. From strandings data, French and UK scientists have calculated that it’s thousands. These deaths have been recorded each year for the last 30 years. That’s three decades of inadequate action. Uncertainties around the true magnitude of these incidental entanglements (bycatch) delays management decisions. Whilst the data on the number of common dolphin bycaught are relatively poor, we know enough to understand that it might be high enough to impact local populations. 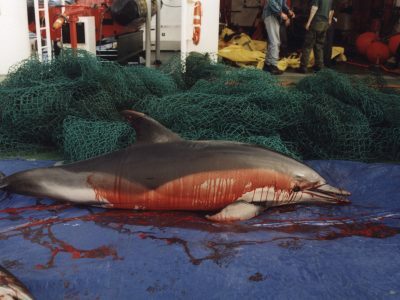 The majority of entangled dolphins and porpoises asphyxiate. When they can’t surface to breathe, they will struggle and can sustain terrible injuries before they close their blowhole and suffocate. Getting caught in a net and being hauled on-board a fishing boat can cause internal and external injuries, such as amputation of limbs, skull fractures and broken teeth. Those who escape or are released from fishing gear can also suffer a variety of injuries from the fishing gear, high levels of stress and exhaustion all of which can lead to reduced long-term survival. Given these horrible facts and that we have the tools to prevent these deaths, why don’t we use them? Firstly, the existing EC Common Fisheries Policy Regulation 812/2004, the main legislation requiring monitoring, mitigation and reporting of bycatch by EU Member States is not well implemented and it is not fit for purpose. The EU is currently revising and replacing this law and, frustratingly, has not taken the opportunity to improve the measures in order to tackle this well-known and preventable problem. There was considerable concern about possible reductions in the existing bycatch measures in the European Parliament in recent votes, but also some efforts to remove some existing protections in some regions (including Spain, where bycatch levels are alarmingly high for common dolphins, bottlenose dolphins and Iberian porpoises), which is clearly very worrying. Whilst Member States should abide by EU law as a minimum (and many do not when it comes to bycatch), each can implement their own measures in addition to those implemented at a European level, but rarely do. The fishing fleets operating in the offshore waters of the English Channel and the Bay of Biscay use different kinds of mobile and static fishing gear and come from many European countries, largely without bycatch monitoring on board. As a result, we have to use very limited existing data from bycatch observers on board just a few vessels, as well as strandings data (mainly on the French and UK coasts and some from the Irish coast), to speculate about the scale of the problem. Only a small number of the dead dolphins who fall out of fishing gear before it is hauled aboard or are thrown overboard will make it ashore. Even fewer bodies will wash up from those entanglements that happen further offshore. Even of those who do wash ashore, will their bodies be found, reported and retrieved for post mortem, to understand and document the cause of death? Based on the bodies we do see, bycatch estimates are about 10 times higher than estimates produced by observer programmes. Bycatch is alarmingly underreported. In many winters, such the winter of 2016/2017, when the winds brought large numbers of dead dolphins ashore there was public outcry about the common dolphin bycatch that is happening needlessly on our doorstep. More generally, bycatch and ‘ghost gear’ are getting increasing attention as the public understand the scale of it and the terrible injuries and losses that dolphins, porpoises, whales, seals, seabirds and other species can suffer as a result. Only by working with fishermen can we find effective and immediate solutions. No-one wants to catch a dolphin in their gear. Equally, no-one wants to eat fish that may have resulted in a dolphin death. By working together, we can understand and provide the right incentives to eliminate bycatch. Sea bass pair-trawling and the use of set-nets are known to result in a large number of common dolphins deaths and so there has been some effort within these fisheries to reduce bycatch in recent decades. Measures need to be tightened up on these parts of the fleet. Since 2015, there has been a ban on the pelagic trawl fishery for sea bass in the English Channel, Celtic Sea, Irish Sea and southern North Sea during February and March, due to poor sea bass stocks. However, high levels of common dolphin bycatch were still observed during these months in 2016 and 2017. Therefore, we need to understand in more detail which other parts of the fleet, particularly the offshore fleet such as pelagic freezer trawlers, high vertical opening trawlers and bottom set gill nets, might also have dolphin bycatch. As an absolute no-brainer, better monitoring is required on a wider range of the fleet, including vessels smaller than 15 metres, using on-board observations, but increasingly the use of video cameras (called remote electronic monitoring). Compulsory reporting of all bycatch incidents by fishermen should be an additional requirement, recognising that this data is necessary and can be used sensitively to inform future management. We need to shift the burden of proof. Pair-trawling common dolphin bycatch. © Fiona L Read. But we do not need to wait to collect more data in order to act. We can implement some measures that would reduce the number of dolphin deaths with immediate effect. New approaches, for example as implemented in New Zealand, include searching for dolphins and not deploying fishing gear when dolphins are seen from the fishing boat and moving the fishing vessel away a predetermined distance. Other simple changes to fishing practices such as fishing only during daylight hours and fishing in waters over a certain depth have been shown to prevent common dolphin bycatch in Galicia, Northwest Spain. In some cases, technology can help to reduce bycatch. There has been some testing of ‘trapdoors’ in the fishing nets, thus providing a dolphin who swims into the net with the opportunity to escape. However, there are welfare concerns associated with injuries that might be sustained in the process of making it through the trapdoor. Limited use of pingers on some trawlers has shown that these may be successful in reducing common dolphin bycatch and warrant further investigation. A sensible next step would include deployment of a multi-pronged approach to reducing bycatch – such as requiring electronic bycatch monitoring as well as reporting bycatch incidents, moving away when dolphins are spotted and not operating at night. The application of pingers should be trialled (including testing for effectiveness) for dolphins who might be missed during a scan from the bridge of the boat or approach the vessel during fishing operations. ASCOBANS, a United Nations body that champions protection of dolphins in the Baltic, Northeast Atlantic, Irish and North Seas, is developing a common dolphin species action plan. If it has robust recommendations, wide country support across Europe and funding behind it, this might provide an opportunity to reduce bycatch alongside other threats that common dolphins face. But there also needs to be communication and collaboration between all countries who fish in this region as some countries, like Ireland and Spain, are not members of ASCOBANS, but fish heavily in the region covered by ASCOBANS. WDC are doing all we can to eliminate common dolphin bycatch and we are working closely with scientists, governments and NGO colleagues in a number of European countries to this end. In the UK, following our campaign last year supported by more than 75,000 of you, a Bycatch Strategy is being developed and we look forward to collaborating with other stakeholders to improve the monitoring and mitigation of bycatch, for common dolphins and for other marine species that are incidentally bycaught. We hope to be able to report positive news on the Strategy’s development and implementation before the end of 2018. But we need your help again! If you haven’t already done so, please support the campaign to eliminate common dolphin bycatch throughout Europe by signing this petition set up by our colleagues at Blue Planet Society. Sarah Dolman is Policy Manager and End Bycatch Programme Lead at WDC. Follow Sarah on Twitter @dolmansarahj.